3/4 in. 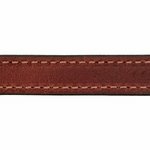 Mendota Hunt Dog Leather D-End Puppy / Small Dog Collar. $19.95. Just what I was looking for. 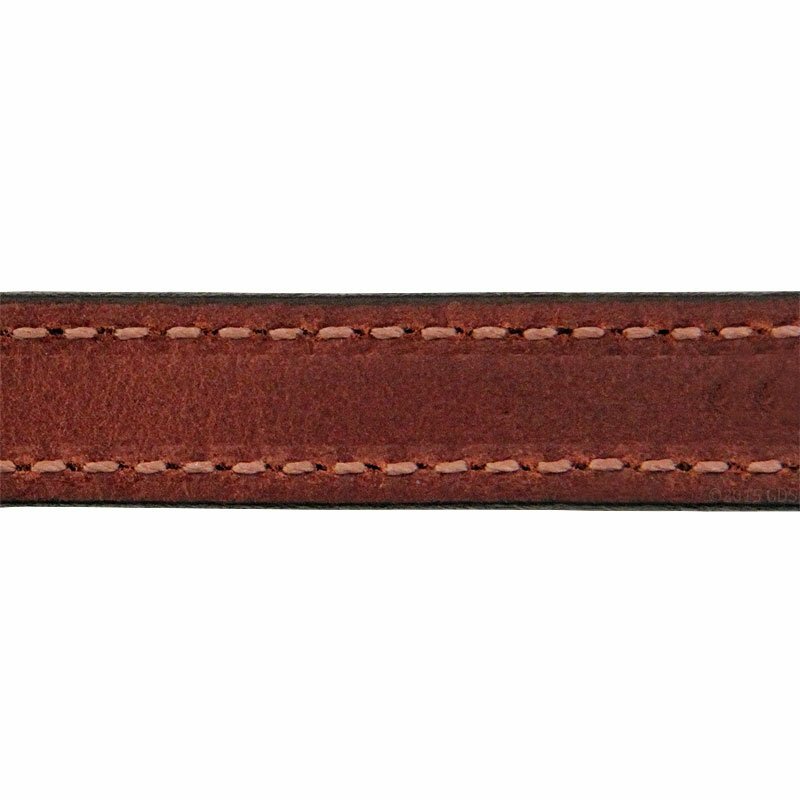 Leather collar with ID. No tag to fall off. Good price and quality leather. Will look here again. Very well made. Had extra tag put on with lic. no. Very happy with fit and finish. Ben Ryer. We have purchased 4 or 5 of these collars since we started using them 5 years ago. They are attractive, reasonably priced and long lasting. The 3/4 inch width suits puppies past 12 weeks, but is still wide enough to be practical on our adult dogs. One of our dogs rarely gets wet. The collar on him has a wonderful patina but is otherwise 100% after 5 years. Another dog can't get enough water. Her collar gets soaked often, but the leather has lasted 5 years before it had deteriorated enough to merit replacement. With the ID tag, which has lots of room for information, you can't beat this deal. Great product. We will buy more when we need to, but it won't be soon! Good looking collar. I like having the name plate in case he wanders off. He is also chipped, but the plate will make it easier to find us. Just as described. Excellent fast shipping!!! Very high quality collar, and very attractive as well. Brass nameplate adds to both the good looks and functionality. Would definitely buy again. Beautiful! Measurement recommendations spot on, and I couldn't have asked for better customer service! I will be a return customer for sure! Beautiful leather. Looks very nice on my dog. This collar is beautiful! It is a very good quality, and I highly recommend them to anyone. As advertised. Great American made product. The sizing chart really helped. The leather and stitching is of excellent quality. Received collars in two days of ordering. Very pleased with product and service. I anticipated the collar to feel cheap because of the price, but the quality is excellent. 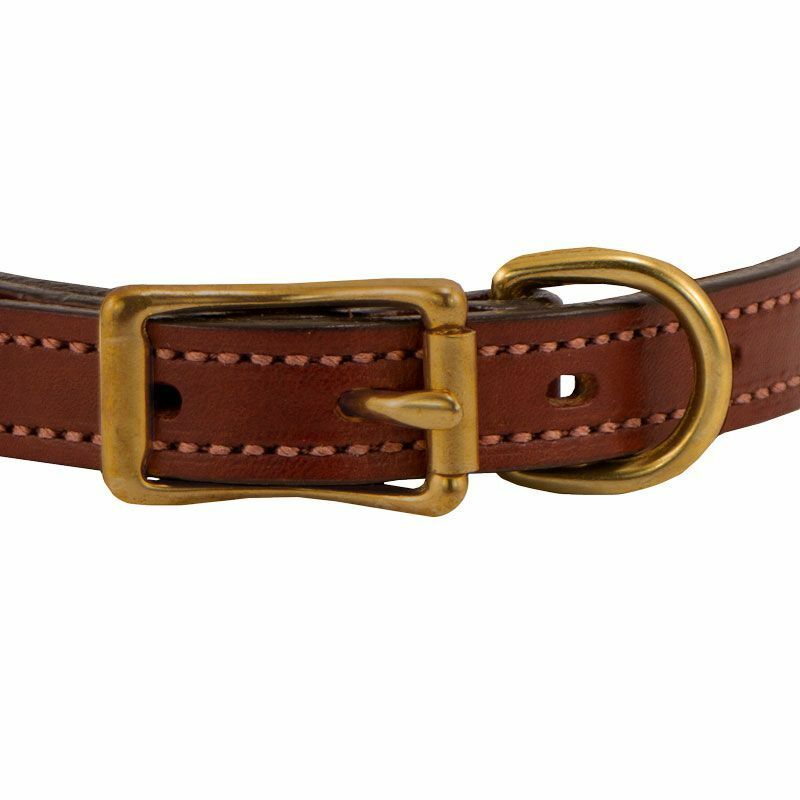 Best quality collar for the cheapest price I've found on a custom leather collar. Wire haired pointing griffon. Hunts. 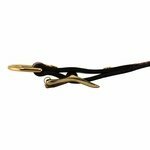 Very well made, size is true, and softens nicely in short period of time. Looks good, fits good, described perfectly, and fast delivery. Very well made. I love that it is made in the USA. Long hair mini Dachshund. Competes. I've purchased this collar several times for different dogs, and recommended it to others quite a bit as well. It is high-quality leather and I love having the nameplate. My dogs don't wear dangling tags, they drive me crazy. Just what I was looking for.I'm glad I found this collar,it's well-made and reasonably priced. This is a beautiful collar and very well made. It was delivered in a few days with the custom brass plate included. The 3/4inch width is perfect for our 38 pound Brittanny. Thanks! This is my forth collar I've purchased from you. I love the quality and craftsmanship of your products. Several of my friends have bought these collars from you as well. I get so many compliments on the collar. The leather is of excellent quality, the tag is very well done, and it fits great! This is an exceptionally well made collar. Fits my small breed dog great. Its a very very good looking collar and makes my dog look great wearing it. The color / hardware combo and the name tag make this a very classy looking collar. It was just what I ordered. Very nice. Great collar and I get compliments on it wherever I go. 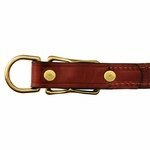 Looks very classy and looks great with a leather leash. 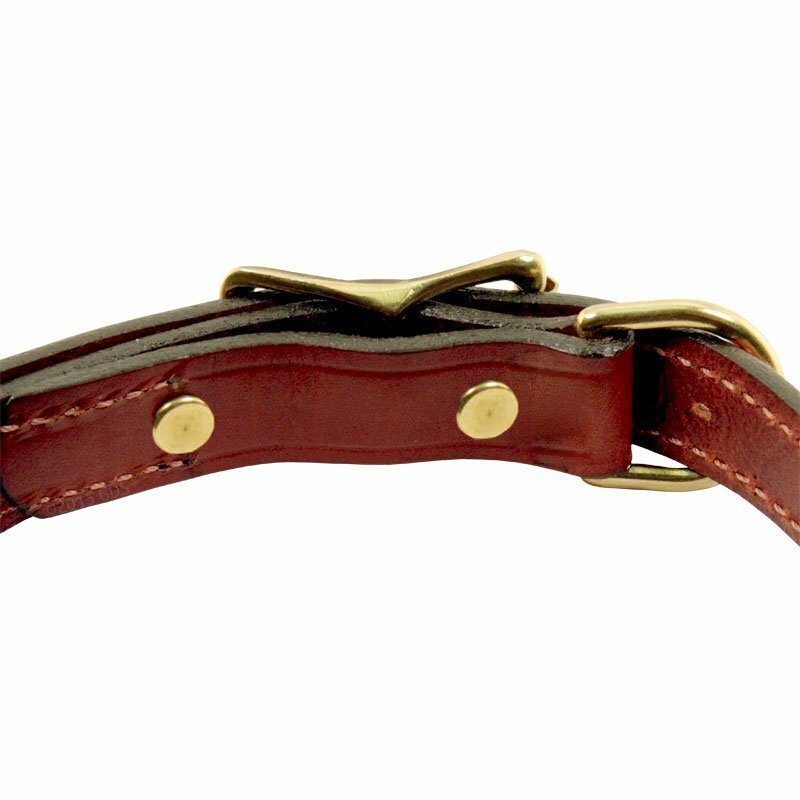 The collar is of an excellent quality leather and is holding up great. Gracie is 10 weeks old and she is wearing the smallest size that is available in this collar and there is plenty of room to grow into. We are very happy with this collar. Much better collar than anything in the local stores. High quality and well made. Our dogs are rough and tumble dogs. They love the woods and the water, and they play hard. 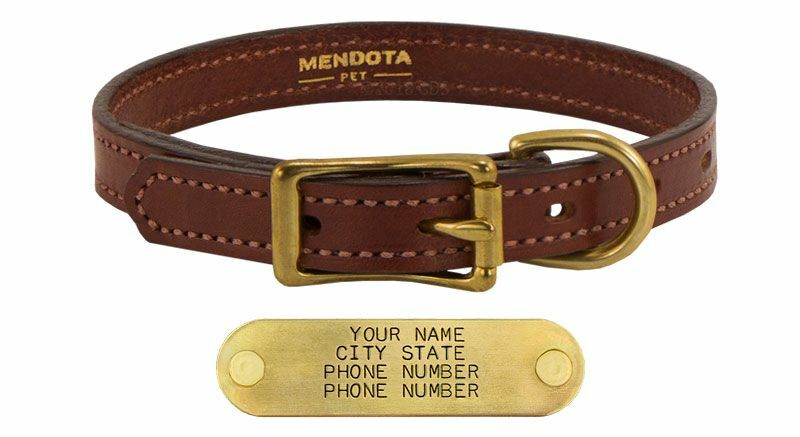 We have four dogs in our household, and we only buy the Mendota collars. They are durable and stylish. Folks always comment on how good they look when they seem them. We bought our first one for our boy Jynx over 4 years ago and have continued to buy these collars as our pack grew. Jynx is now due for a new one because of the water wear, and I know exactly where I am buying it from. Now this is a quality made in America product. I will definitely spread the word on this. Very well made and a lot better than anything you will find in the local stores. Beautifully made! I absolutely love the color and the way the engraved plate came out. It honestly blew away my expectations. Would definitely recommend. Great product. Great fast service. Will recommend Gundogsupply.com to anyone thats hunts or doesn't. I felt like I was part of the family with the exceptional customer service. His neck measured a tight 15 inch, so I ordered the 16 inch and it is a little large-so we cut off the very end and it fits perfectly! Nice looking leather and the nameplate is well done! Thanks! "Fast service and excellent quality!" Fast service and excellent quality! I would definitely recommend your company. "Good collar, thick, heavy leather." Jack Russell. Hunts. Family pet. Good collar, thick, heavy leather. The dog even seems to like it. super fast shipping. super product. "They're well made and look very nice." These are great collars. They're well made and look very nice. The only thing I would change would be to put a keeper to prevent the excess collar end from flapping around, but that's pretty minor. "The name plate is very easy to read and still looks good." With other collars, I would put it on, and the next day the collar had been chewed off. I tried several different styles, but the same thing every time. My dog has had this collar on for 2 weeks. It looks chewed and stretched, but it is still on. The name plate is very easy to read and still looks good. English Setter & Jack Russell. Hunts. Family pet. Great and fast service. Returned item for better fit with no hassle. "Great collar, and great service." Great collar, and great service. I love these collars. I purchased my first one about a year ago. They are so durable! I also love the nameplate feature. We didn't need new collars this time around, but hey, dogs need options too! Your collar is better than the previous ones, which I paid three times as much. "Great collar, nice and sturdy"
Great collar, nice and sturdy -- excellent and quick service, thanks GunDogSupply! "Looks good and doesn't seem to bother him any." Looks good and doesn't seem to bother him any. He sometimes gets out, and I didn't want a collar with a noisy, dangling ID on him all the time. This collar with the nameplate is great. Wire fox terrier. Family pet. Sturdy collar. Well made. Quick delivery. We will order from this site again. Thanks. Excellent quality and price. Better than described. Handsome, well made collar. Fits exactly as described. Perfect for my young border collie. "He is very happy and that makes me happy." Toy Australian Shepherd. Family pet. Just put it on yesterday as we had him neutered 10 days ago. Since he is pretty small, I thought he would be somewhat uncomfortable getting used to it. However, there was NO problem at all. He is very happy and that makes me happy. "Strong, smart looking, very fair price." Strong, smart looking, very fair price. Gun Dog Supply is my favorite website to share with other dog owners. My pit-mix gets compliments all the time on this collar. Rugged, handsome, extremely well-made. Perfect size for my pup at 3-4 months. "Quality and thickness of this collar is great." Sadi said It's a better collar/fit than the last one my owner purchased from some fly by night company. Steve you don't know how long it took Sadie to type this. "The only reason I needed a new one was for a change of address." My second collar. The only reason I needed a new one was for a change of address. "This collar is of great build quality." This collar is of great build quality. It's thick, but not so thick that it will not form to the dogs neck. I get tons of compliments on these collars, and they are the most durable quality. I'd highly recommend them! akbash. lab/swiss mountain dog. Competes. Very nice collar. Will definitely order again. "It is durable and looks very sharp on my little guy!" This is the second collar from Gun Dog. My puppy outgrew the first one. I love this collar. It is durable and looks very sharp on my little guy! I have had many comments on how nice it is. No need to get a collar anywhere else! "Beautiful. Looks great! Excellent finish." Beautiful. Looks great! Excellent finish. Best product. Great company. Beautiful collar. Super fast shipping. "Beautiful quality leather and hardware. Extremely well built." Beautiful quality leather and hardware. Extremely well built. Much better quality than the leather collars from PETCO and PETSMART. Very good quality. The name tag and the print are excellent. Thank you for the prompt shipment. Definitely will by again. Although I love the look of the collar, unfortunately the width is too wide for my small dog. I was unable to locate a thinner collar on the website, and now the collar just sits in the closet hoping one day it will fit. "Beautiful leather and really really well made." Beautiful leather and really really well made. Just like the picture and delivered very quickly. I changed my order to a different style and called in, and it was handled by very nice people. Thank you! This collar worked perfect! Love Love Love it. "I highly recommend this collar." This is by far the best quality collar I have bought for my dog. I highly recommend this collar. Quality is top notch. Service from GDS is even better. I honestly would expect to pay twice as much, if not more for collars this good. I recommend GDS to every dog owner I know - constantly. OK. Not quite what I wanted, but works. Excellent quality and very good looking. She ripped her last collar trying to get a fox, so this style gives me confidence that something like that won't happen again. My only complaint is that it's pretty stiff, which made it really difficult for me to buckle when it first arrived. It's definitely not a collar to take on and off frequently, but I'm hoping it'll soften up eventually. I really loved the collar and the free nameplate but it was just a tad big. Oh well! 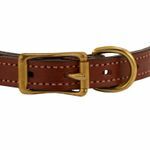 The D ring needs to be placed on the other side of the buckle to help control any extra length. "The color is lovely, the nameplate is well-made, and the price is right!" The leather isn't the best quality, but it's not horrible either. The color is lovely, the nameplate is well-made, and the price is right! The 14 inch fits my dog's 13 inch neck perfectly. "Good value and I would recommend it." I would have liked the option of a 1/2 inch, and in addition (or even for the 3/4 in.) I would have liked the option of a smaller plate (I didn't want 4 lines of text - no need for my address when they have my phone number). But basically I am very happy and pleased with how fast it arrived. Good value and I would recommend it. 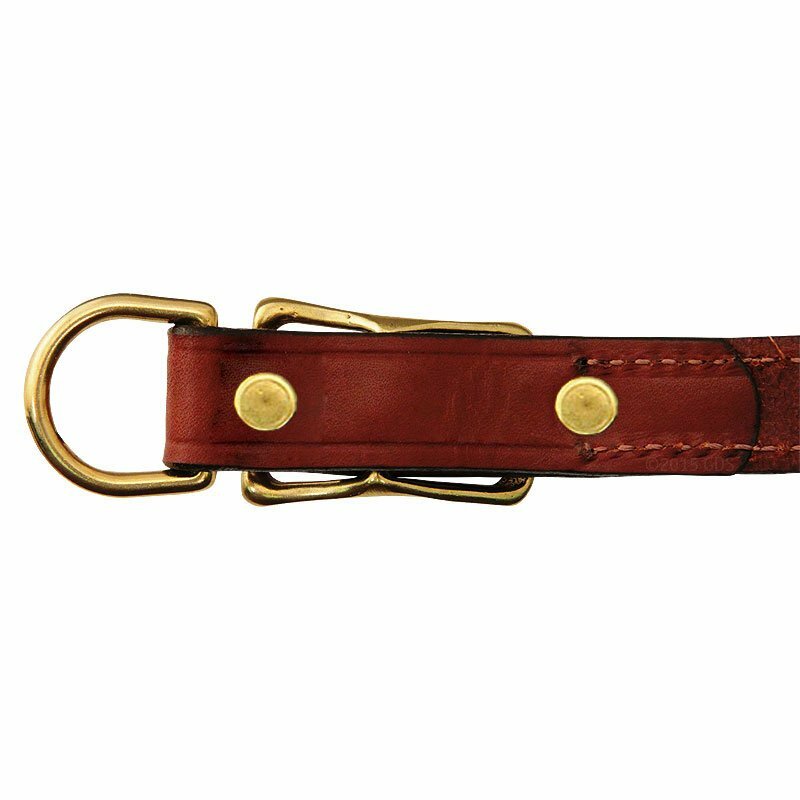 Very good quality collar and very sturdy buckle and d ring. It is way too stiff, and I cannot use on my little dog. So bummed. The leather is not good for small dogs. There is nothing to hold the piece that extends past the buckle, so it curls out. Same for 1-inch. Returned it and got full refund. Steve provided another collar. The neck size (NS) represents the measurement from the center of the buckle to the third adjustment hole. You can adjust 2-inches longer or 2-inches shorter. Keep in mind that using the shorter adjustment holes will leave more collar strap extending past the buckle.